If you have looked at lots of blogs, you have probably noticed something. Very few of them use the full page feature. There is a good reason for this. Your blog’s sidebar is prime real estate because it catches the attention of your reader immediately. We all love those sidebars. As bloggers, they are calling to us to fill them with good stuff. But since most people are distracted by too many shiny objects, we must be careful with our choices. Sure, we want people to subscribe to our blog or newsletter. And yes, it’s great when they click on an ad and the affiliate bucks roll in, but in realty, we also want them to read our posts, don’t we? 1. Treat your sidebar as high-stakes real estate. If your blog was a Monopoly game, the sidebar would be your Boardwalk. 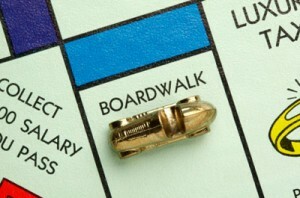 You would screen your tenants before you rented out the Boardwalk to them, wouldn’t you? Same thing with your sidebar tenants. Why would you choose to place a quote you love at the very top of your right sidebar, the spot your readers notice immediately—your prime real estate? Think about your blog’s purpose. If monetizing your blog is a top priority, then ads and affiliate sale graphics need a highly visible spot. Or maybe your goal is to build that email list by asking people to sign up for your newsletter, in which case your signup box should be prominent. Because lots of content is competing for this small, coveted space, the solution might be to use a theme that allows you to customize your sidebars. That means that you don’t have to put the same sidebar content on every page. Putting on your marketing hat, you can figure out the best content for each page. For instance, that Twitter and Facebook feed might work better on the sidebar of your about page. If you have a speaking page, links to purchase your books might be a good fit there. You can even get as specific as promoting a certain service or product on the sidebar of one particular blog post if you are writing on a related topic. It’s your choice. 2. Make it easy to subscribe to your blog—and offer both delivery options. While the experts disagree on whether RSS is dying, your subscribers are still your gold mine readers. They are the people who like your stuff so much that they want to be notified each time you publish a new post. Make it easy for them to sign up. Make sure you ask on every page of your blog. And don’t leave anyone out. That orange RSS icon may be recognizable to your tech-capable readers but there are still people who don’t understand what that graphic is. They are the ones who will want to sign up for email delivery. So make that sidebar graphic large and impossible to ignore. Something like “Get email delivery of Bob’s blog” works well. I stay away from the word “subscribe” because some people think they will have to pay. And if you say “free,” some readers may wonder if that is just for a short time and then it will become a paid subscription. 3. Don’t confuse your readers with blog and newsletter signups too close to each other. Also, consider not placing them next to each other in the sidebar because that just confuses your readers. (“Which one does he want me to sign up for?) If you offer a newsletter, consider giving people the option of downloading a sample issue. Most people will not sign up for something they’ve never seen. With your blog, they usually want to read a few posts first. Same thing with your newsletter. A new visitor usually doesn’t show up, thinking, “Wow. This person is incredible. I must sign up for their newsletter, get on their list and get emails from them forever and ever.” They want to get to know and trust you first. 4. Make your social media connection buttons prominent. When you invite people to join you on other social platforms, you are encouraging them to get to know you on a deeper level. Whether on your sidebar or elsewhere on your site, make your social media connections buttons easy to spot. 5. Clearly display your your blog’s search tools. There has been a lot of discussion in the blogosphere about the value of functions like search, categories and tags. Are they helpful to readers? Do blog searches give random and non-specific results? Are tag clouds passé? There are no definitive answers and bloggers need to figure out what works for them. I can just tell you that there are some reader benefits. Categories (the big picture things you blog about) and tags (the more specific topics) help your readers get an immediate, visual sense of the subjects you discuss on your blog. In the case of tag clouds—that list of words and phrases on your sidebar—your reader knows not only what you talk about, but what you blog about most (because the bigger the word or phrase, the more frequently you have blogged about it). And if they are interested in those posts, a click will take them there. There are no hard and fast rules for selecting your sidebar content. It all depends on what your blog is about, what its goal is, and what you most want your readers to do when they visit. So who is occupying the Boardwalk spot on your blog? @JulianaP16 Thank you for the retweets! Keep your ideas and good links posted too. @thewickedSy aw thank you! glad you find them useful, I’ve been busy producing screencasts too I’ll link you too shortly..
Are You Cheating on Your Blog?